For the past few weeks, Aakhri station was the only topic my colleagues and I were discussing at our office. Now, as it has ended we are still under its spell and for all positive reasons. The storytelling, dialogues, acting, direction and set design – all were done up to perfection. For sure, Aakhri station is one of the gems our television industry has ever produced. This drama series is a work of well-known director and actor Sarmad Khoosat. He always comes up with the projects which are exact need of our society. 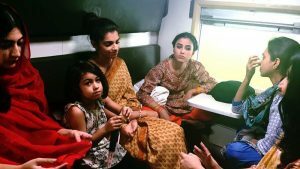 Aakhri station is about seven women who happened to meet in a train compartment. The common elements among them are the miseries and the pain they went through in their life and the courage to say no to all those miseries and pains. They left their houses to find their own identity and a life of dignity. They said no to the abuse and violence they were facing in their life and broke the stereotype of an ideal house maker and achi aorat to get more than that. 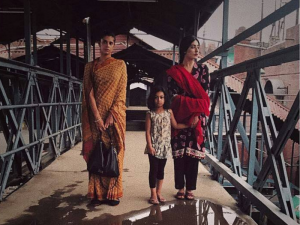 The stories those women shared in Aakhri Station belong to each one of us – the women. Whether it is a young girl who saw her mother struggling with miseries of life or a woman who is blamed for death of her husband or a woman who get HIV virus from her drug-addicted husband or a woman who is told daily that she is not pretty or a pretty woman whose average looking husband suspects her for attracting the opposite gender or a woman who becomes target of acid attack, these are our stories. What inspires me most in Aakhri Station were the dialogues of Irfan Khoosat. His guest appearance with those small but powerful dialogues is definitely the highlight of the whole project. His dialogues tell us that it’s time that we start to give shut up call to all those people who think that a woman has to act sabir and shakir because this abuse is in her destiny. There is no justification for injustice, abuse and wrong exercise of power in any situation. Just for the reason, our older generation had to bear it, does not justify that we should also go through the same. Another factor which inspired me in this drama series is the balance Mr. Khoosat has kept among actors, situations, and the dialogues. The drama shows the real situations which happen in the life of a common person and it focuses on all segments of the society, the poor class, the middle class and the elite. It discusses problems of all of them. The last episode of this series was as perfect as it should have to. 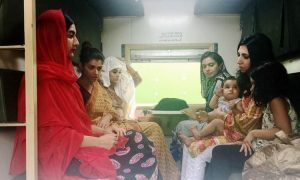 As all those women came out of the train and moved towards the exit, the camera focused on their arms with colorful bangles carrying their baggage was the best scene of the whole drama series. Remember, we do not only have to sing it but also to believe in it.